I was at my brother’s house over the Holidays and had access to his perfume wardrobe (which is pretty good) and it gave me a chance to sample some scents he has but I don’t own. I zoomed in on ‘Love In Black,’ by Creed because, well, Michelle Obama has been in the news promoting her book and I thought this was her scent – of course when I googled it, I was mistaken – her signature scent is Love in White by Creed, this perfume’s twin-set match. ‘Love In Black’ still has First Lady pedigree, though, as it is inspired by Jacqueline Kennedy. It’s classic Creed – you can tell it has good quality, and you can also tell it’s expensive because of that. But again with me and Creed, I found it hopelessly boring. It isn’t unique, and its violet-iris accord smelled just like a lot of other things out there. As time wore on, it became a straight-up iris scent for me – the papery, library kind. It’s nice, but my cheaper Atelier Cologne Vanille Insensee does the same thing, and better. So why pay Creed prices? 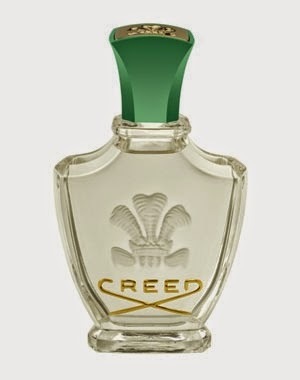 I realize that I had never written about Creed’s Aventus for Men. I guess because I have this aversion towards it – it is extremely popular and for me, it is like talking about ‘Star Wars:’ I just do not want to join the conversation. I had been given a nice sample of Aventus for Her when it first came out, and I never used it. Well, now that I am going through my samples, I said I might as well. I know it’s a fruity floral, and I thought why not wear it on a California Summer Day? Well, my thoughts go two ways. On one hand, this is a nice commercial fruity floral – the green apple/peach combo is a crowd-pleaser, and mixed with the rose and woody musks, it is blended well that it wears well, and I find myself smelling myself and smiling. On a nice warm day, this can certainly put a smile on my face. But, this is Creed, and should a Creed fragrance something more? I mean, the price points are just insane at this point. A 16 oz bottle costs a thousand dollars ! I certainly would never buy this because I am just not moneyed enough for it, and it doesn’t excite me. It acts and feels like a nice department store fruity floral, and I bet the quality is a little better, but I think what you are paying for here is the prestige of the house, and the bragging rights of wearing Creed. So pardon me if I pass. It’s Summer finally, and feels like it. Here where I live in Los Angeles, it’s very pleasant, and since I am near the beach (only three miles away) I don’t have it as bad. I’ve been known to love those dark and heavy orientals but I also am a big fan of ‘summer themed’ fragrances.’ If something smells like the beach or suntan lotion, I am usually drawn to it, like Estee Lauder Bronze Goddess or Bond no 9 Fire Island, just to cite two examples. Since I don’t think I will be having a summer trip this year (just started a new job) I am just going to try recreating it via my scents. Thank God I found a nice generous sample of Creed’s ‘Virgin Island Water’ in my stash. Yes, I know I am not the biggest fan of Creed in general, but if there was one scent from their line I would love to own, it’s Virgin Island Water. Because, really, it’s like going to the beach. I can sum up the perfume in two words: coconut rum. It’s a nice coconut note with a boozy rum note. That’s all there is to it. Of course there’s more to it – lime, hibiscus, jasmine. But it’s well blended and the coconut and rum dominate it evenly. And as I wear it now here at my desk job in a high rise building in the city, I can close my eyes and feel like I am at the beach with a drink in my hand, and somehow someway it is good enough. Hidden among my samples: Creed’s ‘Original Santal’ This was released in 2005 and can you believe I never tried it? I have this wary feeling about Creed fragrances – for me, more often than not, they are too expensive for what they are, and also, if you like any of them, you can probably find something similar out there. But I also can’t help but be bored by it. It’s no different by your run-of-the-mill department store fragrance. It’s solid but staid, and has no projection. I know I would never buy it at that price and if I had wanted it, I hear that Individuel by Mont Blanc is a pretty good alternative. I’ll use my sample but I won’t look back. I have a love-hate (well, mostly hate) relationship with the House of Creed. A lot of this, surely, stems from the fact that their line is so darn expensive, and in my opinion, some of them aren’t exotic or unique enough to warrant the exorbitant pricing. They are well-made perfumes no doubt, just…boring for the price point. (For example, Frederic Malle is more or less in the same price range but I feel like they are worth it) I have a couple of Creed’s ‘Greatest Hits’ on my collection, but rarely wear them. Recently, though I went to the Creed stand-alone store just to see what they have, and the SA suggested Royal Mayfair to me. And surprise of all surprises, it was utterly wonderful. Like, swoon-worthy. Known as London’s most posh neighborhoods, Mayfair is in fact one of the world’s premier fashion hubs. To honor this destination, and the location of the legendary Creed boutique on Mount Street, the House of Creed has re-launched the famed, limited edition “Windsor” scent originally created for the Duke of Windsor. Now officially re-named, Royal Mayfair is a fresh, bright, masculine green scent that stuns with its crisp, gin-and-pine led opening, its fragrant floral heart, and its delicate yet forceful aromatic woodsy drydown. I mean, if it’s good enough for the Duke of Windsor, then it’s good enough for me! I know that this perfume was originally released as ‘Windsor,’ and is technically a man’s fragrance, which is interesting to me because this perfume reads to me as mostly floral. Royal Mayfair opened to me with a big burst of tuberose, perfect for the white floral lover in me – but there’s something musky/salty in the opening, probably the combination of cedar and eucalyptus. The only way I can describe it is that it smells ‘radioactive,’ giving it an ‘alive’ vibe. (I bet it’s the ‘orange’ burst that does this) I know some people smell rose in here, but to me I only get a very faint hint of it. It all gets woodsier in the drydown, which is very boozy, with you smelling a little bit cignac-y. It’s all very tantalizing, although the two times I wore it I have to say it disappeared very quickly on my skin, and I am out of my sample now so I cannot really tell if it always does that, and if it does, boo! But I have to say when ti is on, it’s on! If you weren’t invited to Grace Kelly’s wedding day in 1972, you can at least have the olfactory experience of being there when you are wearing Creed’s Fleurissimo, which was commissioned by the Royal prince Of Monaco for her to wear on her wedding day. Can you believe I never smelled this perfume until today? But, finally, I tried on a sample I have of it. It;’s a white floral, with notes of tuberose, violet, Florentine iris. It’s a nice restrained floral, and I don’t know if it was originally done like this, what with modern reformulations. The tuberose is discreet, not having the traditional indolic tropical feel of most tuberose scents, and I think it is because of the violet note which gets more prominent in the middle and dry down of the scent. I like it, but don’t love it. Without the “back story” behind this, I don’t know if I would even give it any attention, though I have to admit the idea is very tantalizing.